Estate Tax is a required payment to the Federal or State government for the transfer of assets from one person to another. There are exemptions for a specific dollar amount listed below that permit transfer without payment of tax (or even a filing of a tax return). There is an exemption on the first $5,340,000 per person for 2014. For married couples, the there is a device called Portability which allows one spouse, upon his or her death, to transfer any unused credit to the surviving spouse. Thus, for married couples, the effective Federal Estate Tax credit is $5,340,000 x2. Any amount owned at the time of death in excess of the Estate tax credit is taxed at a rate of 40%. A gift is an asset conveyed to another without reservation of rights in the asset conveyed. There is a federal tax on the transfer of gifts. There is an annual exclusion on the transfer of gifts. If a transfer does not exceed the annual gift tax exclusion, $14,000/per person making the gift for 2014, neither a gift tax return nor gift tax is required. If the gift exceeds the annual gift exclusion, a gift tax return must be filed. Even if the contribution does exceed the annual exclusion there is an option to use the exclusion amount over a five-year period. There is also the lifetime gift exclusion of $5,340,000 as of 2014. 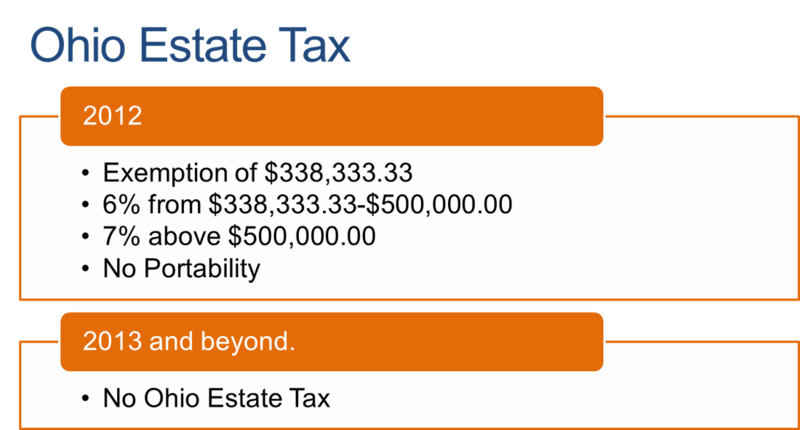 As of 2012, there is an Ohio Estate Tax exemption of $338,333.33. The effective tax rate above the credit is 6% from $338,333.33-$500,000.00 and 7% above $500,000.00. There is no Portability in the State of Ohio. 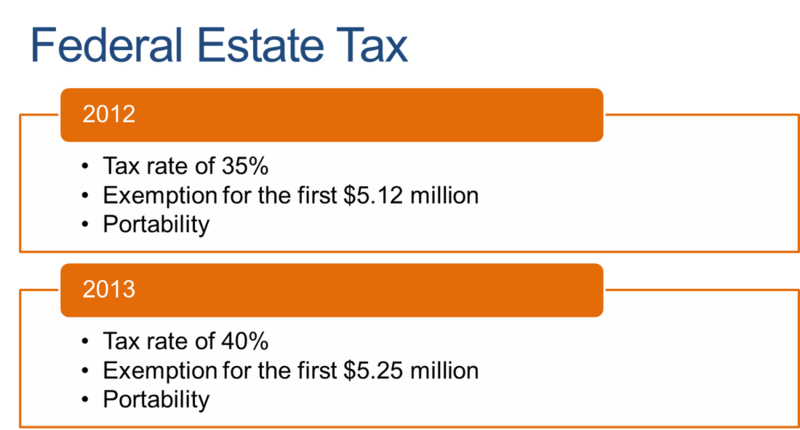 Effective on January 1, 2013 the Ohio Estate Tax has been repealed.